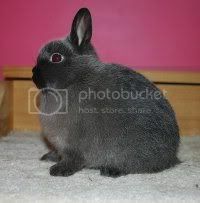 Netherland Dwarf – Suzy’s Stacey. Click for more about Stacey! The Netherland Dwarf is a very popular breed of rabbit, both as a pet and a show animal. These bunnies are very small with round faces and bodies. The show quality ones have much more rounded faces and bodies, with shorter ears, than many dwarfs that live a pet life. Smoke Pearl, Sable Point, Sable Marten, & REW. New Zealands in broken, black, and blue! Located in Beautiful Castle Rock! Chestnut, Otter, Black, brood does, cages and rabbit supplies for sale. Juniors and seniors, all with pedigree. Need to sell entire herd reasonably priced and willing to travel reasonable distance to deliver. 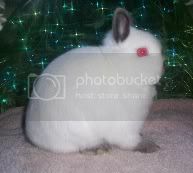 Small rabbitry, specializing in shaded Netherland Dwarfs, show and breeding. Enjoy looking over our website. Showing in ARBA youth and 4H. 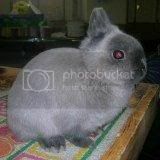 Cute blue himalayan netherland dwarf – won class at ARBA convention 2011 – Farrah S.
Netherland Dwarf: REW, BEW, Black, Chestnut, Otters and Brokens. Sometimes other colors do pop up and are made available. Dedicated to producing show quality dwarfs.